Product prices and availability are accurate as of 2019-04-23 10:28:21 UTC and are subject to change. Any price and availability information displayed on http://www.amazon.com/ at the time of purchase will apply to the purchase of this product. 18k 5n pink gold case with a black alligator leather strap. Fixed bezel. Grey dial with rose gold-tone hands and index hour markers. Minute markers around the outer rim. Dial Type: Analog. Manual wind movement. Scratch resistant sapphire crystal. Pull / push crown. Case diameter: 40 mm. Case thickness: 6.79 mm. Round case shape. Tang clasp. Water resistant at 30 meters / 100 feet. Functions: hour, minute. Luxury watch style. Watch label: Swiss Made. 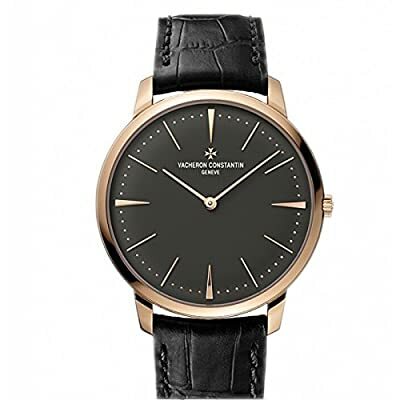 Vacheron Constantin Patrimony Grey Dial 18k Pink Gold Manual Mens Watch 81180000R-9162.